As you are aware, the precious metals complex has been in a correction mode since July and has gone quite a ways in working off this overbought condition. One item that has helped to slow down all commodities has been the recent strength in the US dollar. It is rare for gold and silver to rally big during dollar strength, and it is a headwind that needs to be overcome. Because of all the unknown strife that exists throughout the world and the as yet unknown result of the US elections, we cannot rule out the dollar and gold rallying at the same time as people search for a safe currency as well as wealth preservation. 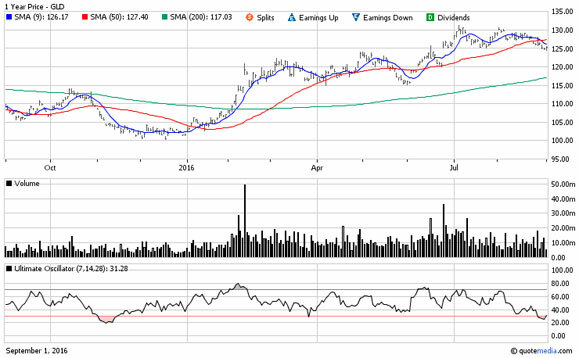 We include the chart of GLD, the ETF for physical gold with the ultimate oscillator at the bottom. As you can see, this has been a great place to add to positions this past year.